Brian Snyder/ReutersHarvard Business Schools graduates celebrate upon receiving their diplomas. Harvard Business School has produced 64 billionaire alumni, the most by far of any graduate business school in the world, according to a new report from Wealth-X. 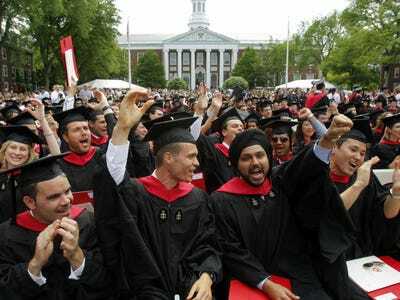 There is a massive gap between Harvard and even the next highest ranked business school, Stanford University, which has 23 billionaire MBA alumni. No other university had more than 20 billionaire business school alumni. American universities dominated the business school alumni billionaires list, representing seven spots in the top 10. According to Wealth-X’s report, nearly 50% of all billionaires with an MBA recieved their graduate degree from one of the 10 schools below. Wealth-X also recently released a report on schools with the most undergraduate alumni billionaires, with the University of Pennsylvania topping the list with 25 former student billionaires. Wealth-X president David Friedman told Business Insider that UPenn’s billionaires represent successes in an array of fields, which suggests that the university isn’t focused entirely on channeling students into financial services or technology.